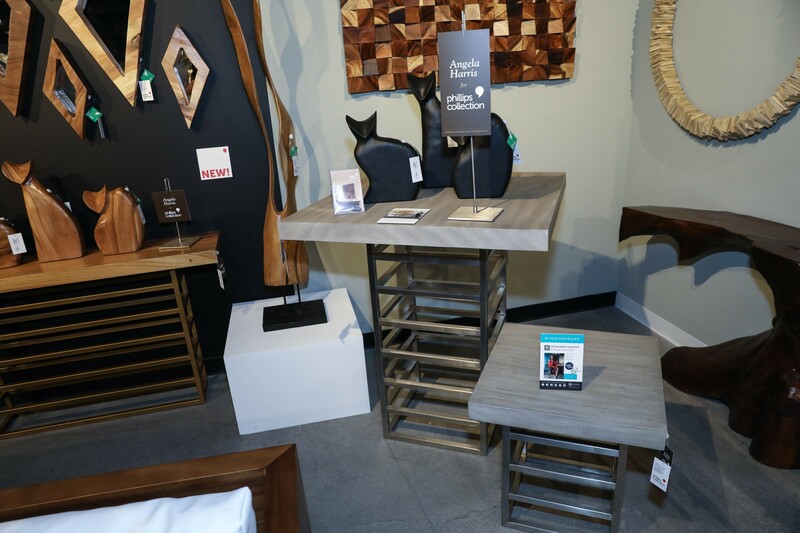 Las Vegas Market, a biannual design event often referred to as "Market," is the largest event of its kind on the West Coast, and it's a great place for industry insiders to discuss trends, share ideas, and mingle. Because it's such an important event, the House Tipster media team descends on the World Market Center to be a part of the action every winter and summer. We recently returned to Vegas for the Summer 2018 event, and were pleasantly surprised to meet up with some of our friends, including Jason Phillips, Vice President and Creative Director of the Phillips Collection, and Angela Harris, owner of Trio Environments. 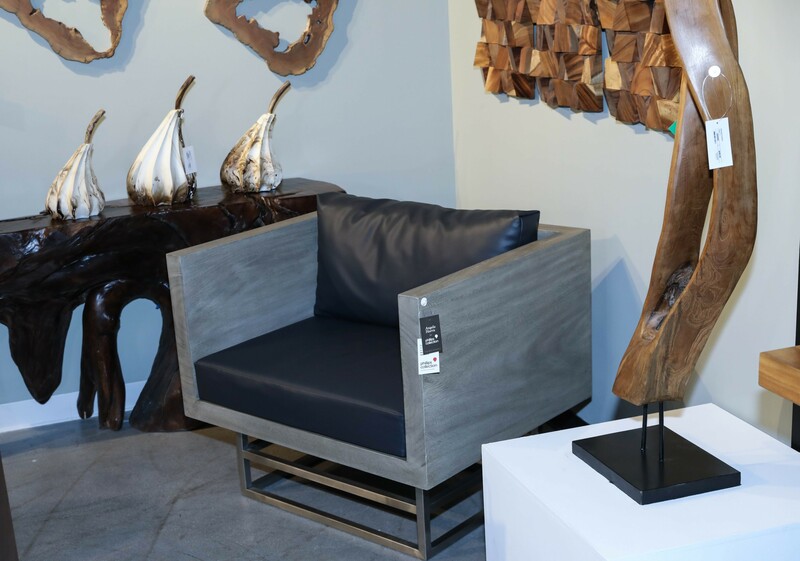 During an exclusive interview with the renowned interior and product designer and House Tipster host, Christopher Grubb, we learned about the latest design collaboration between Jason and Angela, along with how the duo has infused different materials into the modern and elegant product line. Christopher, an interior designer who has consistently sung the praises of both the Phillips Collection and Angela Harris’ work with Trio Environments, was thrilled to see their collaborative effort up close. He noted that Jason’s showroom for the Phillips Collection “is such a standout,” and Angela’s designs fit seamlessly. “[The collection is] a great juxtaposition of materials, and includes the type of architectural pieces that I like to use in my work,” said Christopher. But how did the partnership start, Christopher wondered? According to Jason, Angela is a longtime client of Phillips Collection. “She came to us two years ago requesting custom designs, and her designs were stunning, so we asked her to put these into a collection,” he explained. Her work marries solid woods and metals into one-of-a-kind seating and furniture, with accessories set to debut in the fall. “We’re excited about how it’s all playing out,” Jason gushed. A noteworthy marriage of materials comes in the form of acacia wood with a dullish, light sheen finish in the Ladder collection; it’s a combination Christopher has seen in commercial environments, but that’s fairly new to residences. Angela elaborated on the Ladder collection, adding that it’s inspired by her work in the architecture and building environments. “We’re always looking for artful, intentional pieces,” she said, and this collection fits the mold. Angela Harris for Phillips Collection’s Intersection collection is also inspired by buildings, but with more of an urban feel. As Angela was working on a multifamily building project, she knew she needed furniture to match the rest of the building materials, which is how Intersection was born. It’s a line chock-full of metallic sheens and streamlined edges, perfectly appointed for modern environments. 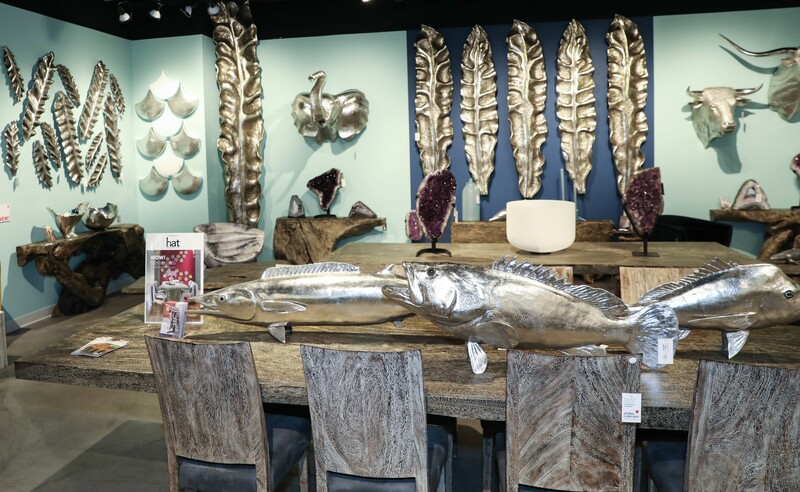 While browsing the showroom, Christopher immediately noticed an abundance of silver finishes, which is a “nice break from all the gold” we’ve seen for the past few years. Jason elaborated on this, stating, “we’ve always had silver in our line, and yes, gold has been all the rage, but I think silver can work in every room.” He joked that he hopes Phillips Collection has played a small part in bringing silver back. Grey is also a big color throughout the Phillips Collection. The company’s signature Greystone is found throughout Angela’s collaborative line with them. “When we saw the Greystone finish last season, we fell in love with it. Phillips Collection is the only manufacturer with something like this,” she told Christopher. Another way Phillips Collection is staying on-trend is by focusing on their outdoor offerings, and finding the perfect materials to ensure they’re hearty and stand the test of time. “These are products that you can use outside on the front porch, by a pool, and on the patio,” Christopher mentioned. According to Jason, each design for outdoor furniture and decor starts with the materials. 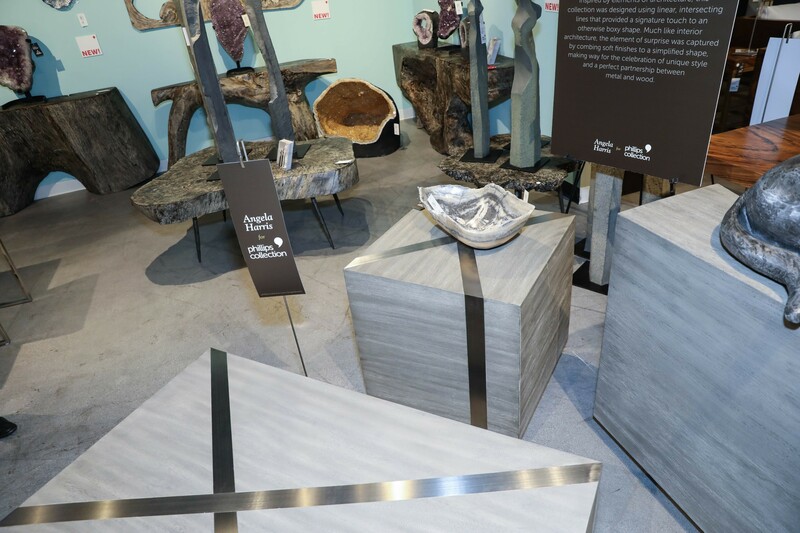 His team uses reconstituted stone, teakwood, and stainless steel so that each piece of wall art, sculpture, and all the furniture can meet the demands of harsh climates throughout North America. Christopher describes the collection as pieces of art that are pricepoint friendly. When two design powerhouses unite and design a collection of this magnitude, it feels meant to be. We are excited to check out the accessories from Angela Harris for Phillips Collection in the coming fall, and can’t wait to see what else comes out of this special partnership. Follow this link to see more from Angela Harris for Phillips Collection.